bye and lucky to be here still. piece of news about the icons passage and that was against the Zulu’s tradition. 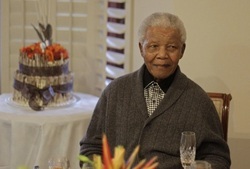 if they had failed, the world would have asked questions about lack of coverage for a man of Mandela's stature. his life now and in future is about celebration of the triumph of good against evil. does not reside with humans, but with God. Mugabe cannot trust to hand over power to people of his own color. ferociousness of the struggle alone that forced apartheid to the wall, but the touch of an unseen power in the heart of F.W. on a path of freedom. embodiment of wisdom, one who has elevated the craft of politics to art. good of humanity. It was the reason for his ability to discount the State House and chose to live in the comfort his own home. conquest against ill health and his victory to be here still with us.